In the early 1980’s, a collection of young artists from around the world met at the Lecoq conservatory in Paris and went on to important careers. Lilo Bauer and Leah Hausman direct opera, Simon McBurney launched Theatre Complicite in London, Joz Houben works with Peter Brook and teaches at the Lecoq school, John Flax and Elizabeth Wiseman founded Theater Grottesco in the U.S., and Ronlin Foreman became one of America’s foremost clowns. These are some of the expletives given by reviewers across the country for Foreman’s performances. 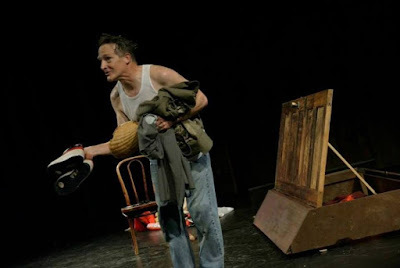 Theater Grottesco is delighted to present one of America’s greatest living clowns, Ronlin Foreman, for ONE PERFORMANCE ONLY on Tuesday, November 10, 2015 at 7:30 p.m. at Teatro Paraguas (3205 Calle Marie, Santa Fe). Tickets are $15 general admission $10 students.